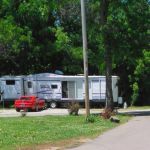 Ask fellow campers about "Brooks Mobile Home & RV Park" and nearby attractions. First there are no signs. I was told to take exit 120 off I-65. There is no such exit. I called for instructions and was told when we got here to enter and go all the way around the park to our site on the left. That left the hook-ups on the wrong side so we had to make a very sharp turn and move a flower pot. The grass was so high we couldn't find the water. The park was junky and very run down. We would stay in Walmart parking lot before we would stay here again. We camped at Brooks Mobile Home & RV Park in a Motorhome. So sorry that you got the wrong information. Normally our Camp Host and Assistant Manager go out to meet every new guest at their sites and helps them get hooked up. Scott was filling in on the phones for us because our camp host was on vacation, and there must have been a lot of serious miscommunication. Our website states in more than one area that you take the Brooks exit 121 off of I-65. There is only one Brooks exit. We checked the lawn after receiving this review, and it was only 3" which will cover up the low hookups sometimes. The park is very safe and quiet. 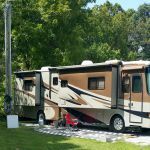 There are 45 RV sites in our 10 acre park with new pavement. We are removing older mobiles out of the park, and there are only two 80's homes left, the other 13 homes are newer homes brought in in 2012. We turn away 50% of the applicants for our homes because we only allow the best people in our homes. 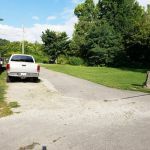 We are the only RV park in the Louisville and surrounding area to have concrete pad lots and creek front lots available. Needs a lot of work done to the sites. Weeds everywhere. Rock & grass sites. I didn't see any sites that looked like the photos on the website. Recommend keep driving. There is another campground right down the road. We camped at Brooks Mobile Home & RV Park in a Motorhome. This review sounds like a conflict of interest. The photos here and on Google are of our park, and I will be adding more pics. We have a lawn care crew that comes out anytime the park needs done and does a great job manicuring the park like a resort. We also have a landscaper who now works for us a few times a week planting flowers and keeping the ornamental trees and bushes trimmed and mulched. The other park several miles away from Louisville down the road gets worst reviews than we do. The park does not look like the pictures seen on the web! The sites are just gravel thrown over grass and are NOT level. The whole place is rundown and a mess! Over priced for no amenities and it is rundown! RR tracks on the way to park scrapped our stabilizers! We camped at Brooks Mobile Home & RV Park in a Fifth Wheel. We stayed at this park for 1 month. Utilities are all good and Wifi is excellent. A friendly, helpful staff. Easy on and off of I-65. We were in site #50 with a 40 foot fifth wheel. We would stay again. We camped at Brooks Mobile Home & RV Park in a Fifth Wheel. Shopping everywhere and a NICE laundromat is close by. Also a big Dollar General is real close. 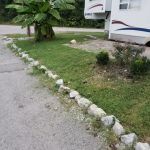 After reading the negative reviews, I was hesitant about staying at Brooks mobile home and RV Park. After arriving I immediately wondered if the negative reviews were actually from people who have never stayed here. We stayed for two days it was very clean and kid friendly. I will happily stay here again when I'm in the area. Don't be misguided by negative reviews. Stay there and find out for yourself, you won't be disappointed. We camped at Brooks Mobile Home & RV Park in a Motorhome. If you have time with kids Jefferson Memorial forest and Kart Kountry are great places to visit. Without children there's brooks hill winery. Great area to explore. What I look for most when staying somewhere is safety and security. This Park was very safe and secure, I slept well. Extremely friendly and helpful manager. Very clean and spacious we will definitely stay here again. This area is one of the safest places around Louisville. You can shop and eat anywhere around Brooks without problems. The southern hospitality there is wonderful. We camped at Brooks Mobile Home & RV Park in a Motorhome. Warning. We live in our RV and have traveled all around the US. I don't know how the term RV Park got included in the description of this place. IT IS NOT AN RV PARK! It's a run down mobile home park with one or two places to park an RV. Many of the mobile homes are literally falling down and one of them was being hulled off while we were here. I didn't see a shower/restroom or a garbage station anywhere. We got trapped in a storm and had to pull off at this place. Never again. We camped at Brooks Mobile Home & RV Park in a Motorhome. This is a Trailer Park NOT RV Park . We were in site 32 and there were RV trailers on both sides of us BUT they were permanently hooked up . Junk around and large propane tanks freestanding able to fall if touched. If I had reviewed this place on this site , we would never had stayed one night ! The trailer park is on the final approach of the major airport , landing every ten minutes ,one hundred yards away from train tracks , train every 3 hours. It was a dump, they are close to the race track and that the only reason we went there ..... Never again. 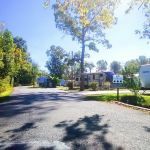 We camped at Brooks Mobile Home & RV Park in a Travel Trailer. Even for an overnight stay I would not recommend this park. Not located in a nice area. It is dumpy looking, is mostly mobile homes, and as a semi urban park is rather tight with narrow roads for longer rigs. It also is noisy: in the flight path of the Louisville International Airport, trains seemingly right adjacent to the park, and a bunch of roosters next door. Really no nice place to walk your dog. Further the electric service is 50 amp ONLY so I had to purchase the adaptor which they sold for an additional $30.00 making this a $65.00 night. Buying a new piece of equipment isnt so bad, but nothing was said about the lack of 30/50 amp hookups by the reservationist who of course knew that I was pulling a travel trailer. There was standing open sewage around the sewer hookup. No picnic tables or public batrooms. No labeled park office. Site #13 was easy enough to get into and long enough that I didn't need to unhitch, but others not so much. If you have to stay here, get one of the pullthrus, but I say stay somewhere else. We camped at Brooks Mobile Home & RV Park in a Travel Trailer. Sorry to hear about this guest having so many issues. This park is located catty corner to The Crossings golf course and 5 minutes south of a South Park Country Club. 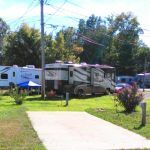 It has mostly RV sites, and we do have less than 20 mobile homes. We are removing older mobiles regularly. Very rarely do we have sewer issues, and if we know about them, we fix the problem immediately! As for purchasing the 50 to 30 amp adapter, we do allow people to borrow them with a $30 refundable deposit. The roads were recently paved, and there are a couple of nice woodsy grassy areas to walk your dog. We do have picnic tables, and are having new ones made for every lot. The management was changing locations, but the park Brochures and our website clearly states where the office is. I'm not impressed at all, junky old mobile home park, railroad tracks less than 100 yards away. Management allows the mobile homes to pile stuff around trailers. We camped at Brooks Mobile Home & RV Park in a Fifth Wheel. Not a destination park. Deep gravel. In the winter months the grounds do look brown and grey in the Louisville area, and the park is so much more beautiful in the spring, summer, and autumn. The park in a nice safe area. The railroad is 400 yards away, and trains are not continual. We do not have any highway noise. Management in this park is very strict about keeping the park clean and uncluttered. Guests and tenants are not allowed to store stuff outside. We do background checks on all of our tenants, and we turn away 50%+ of our applicants. We do our best to please all of our guest, but some people don't like staying in a park that has mobile homes. Louisville is a great city to visit, and we provide affordable and dependable full hook up sites with great WIFI, over a dozen concrete pad sites and over a dozen creek front sites to choose from along with standard gravel sites, and friendly neighbors to all those wanting to come visit the city and see all the attractions in the area. 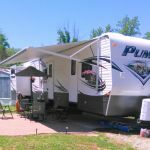 Are you affiliated with Brooks Mobile Home & RV Park ?